November is here 🙂 Let’s kick it off with a bang! 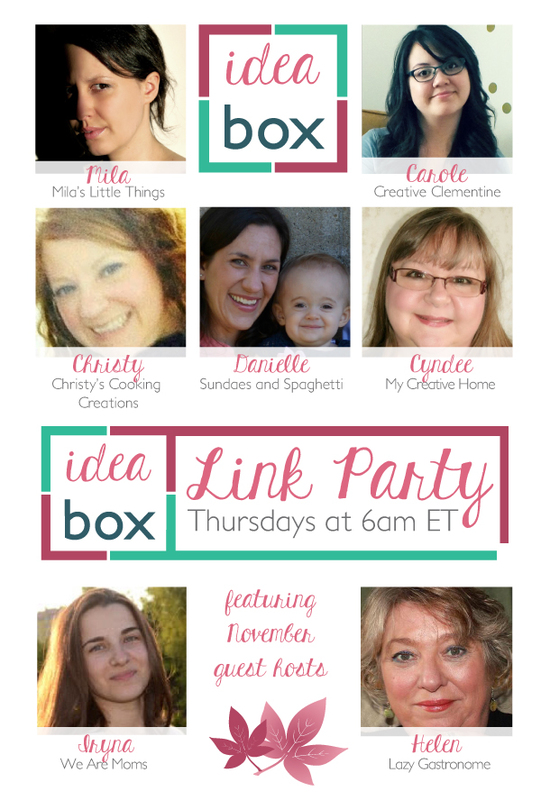 The hosts of Idea Box are happy to introduce two new guest hosts for November! Please help us welcome our new blogging pals, Iryna and Helen! Next PostWhat do you think about Jimmy Kimmel’s Halloween Candy Prank? Thanks for hosting this week, Mila. I love your features, especially the most viewed one! And welcome to Idea Box, Iryna and Helen! Have fun meeting new people and hosting this month. Pizza balls! Me likey – yum! These ninjas made my day- so funny and cute! Thanks for hosting. Love seeing all the festive holiday items. Thanks for hosting such an awesome link party! Have a wonderful weekend! Thanks for hosting, Mila! I love seeing the variety of links, they were really great this week! Thank you so much for the feature, Mila! You made my day! Thanks so much for hosting and for having me. I loved your posts this last month, you have taught me so much about Halloween and it’s traditions! Thanks! Thanks! I was happy to share these old traditions 🙂 I hope to share more of these, especially during Christmas time !